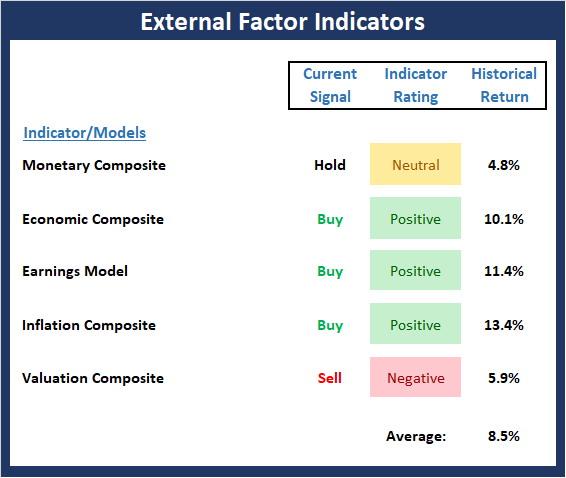 This week, we’re featuring the External Factors Indicator Board, which is a group of indicators that are believed to drive stock prices on a long-term basis. There are some modest shifts within the External Factors board of late. First, the monetary composite continues to improve as one can argue that there has been yet another false start to the big, bad, bond bear. Second, while both the economic and earnings models remain positive, the model readings have been slipping of late. And finally, although the valuation composite still sports a sell signal and a negative rating, valuation metrics are improving. This is big. In Fedspeak, these words meant that the Fed’s projected rate hikes aren’t preset and that based on the “data,” the next hike was likely on hold. This fits with the “soft” U.S. economic data that has been coming in of late as well as market expectations for rate hikes. 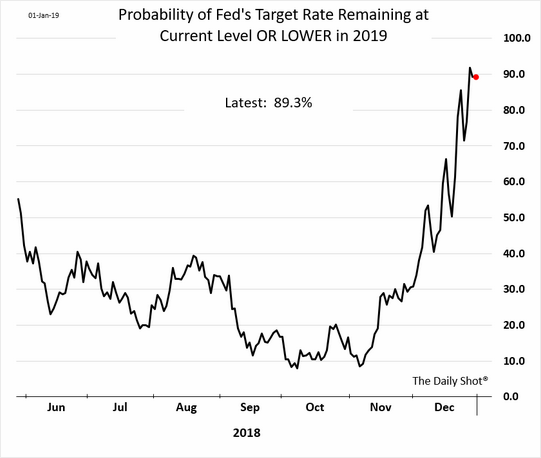 On that note, below is a chart showing the probability of the Fed NOT hiking rates in 2019. However, from my seat, the idea of the Fed pulling back on the two projected rate hikes wasn’t the main course here. No, it was the 4-7 “accidental” hikes associated with the balance sheet reduction plan (aka the $50 billion per month “QT”) that worried me more. So next, and in my opinion, more importantly, Powell said, “We wouldn’t hesitate” to change balance sheet policy if needed. There it was; the official proclamation that the Fed wasn’t going to do something stupid and “accidentally” push the economy into recession. Phew! In my last blog post, Apple had pre-announced less than expected earnings news and stocks were looking sharply lower on Thursday morning. Besides commenting that it was probably a day to just sit back and watch, I also offered that historically, news like this from Apple usually comes near stock market lows. Thursday had an unusually dour feel to it. It seemed like the parade of pundits were all talking about an immediate retest of the Christmas week lows and that investors should be out buying bottled water and canned goods. My Twitter feed was full of Treasury bond bulls taking victory laps and calls for a much worse bear trend. Application Deadline: January 18, 2019 – Apply Today! 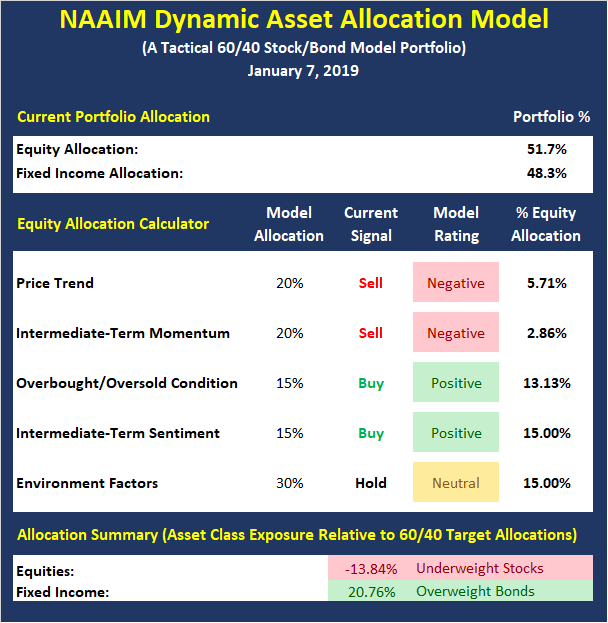 Q: What do you expect to be the key driver of stock market performance in 2019? The most important factor will be continued earnings growth in the context of a reasonable economy. This year saw stocks lower despite excellent earnings increases. The skeptical market reacted by punishing companies with any flaw in their reports and virtually ignoring those that did well. The result was a compression of PE multiples – a classic sign of negative sentiment. Q: As we approach 2019, are you bullish or bearish on U.S. stocks? I am bullish on some and bearish on others. It depends on the stock and sector. Sectors that were out of favor last year should do very well. 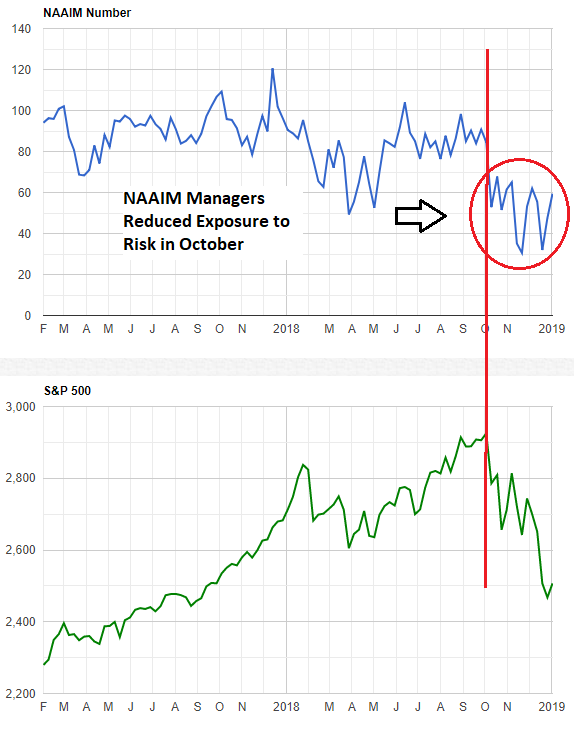 Those that rose because investors were blindly reaching for yield or perceived safety may not keep up. 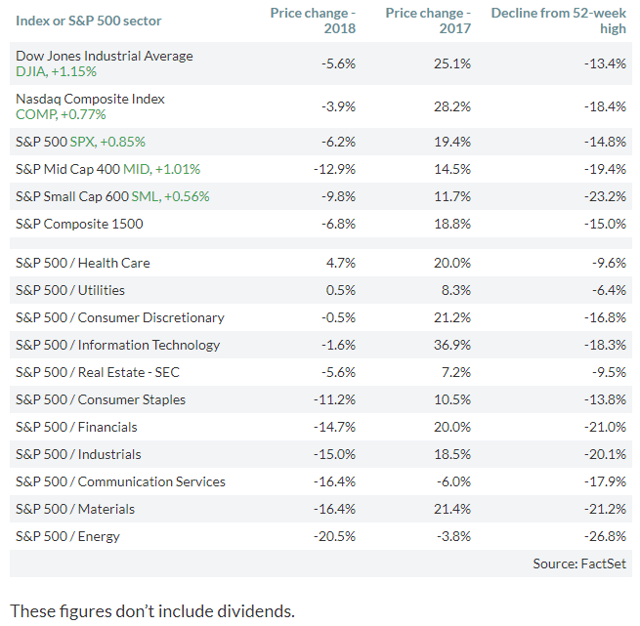 This table from MarketWatch illustrates the difference. 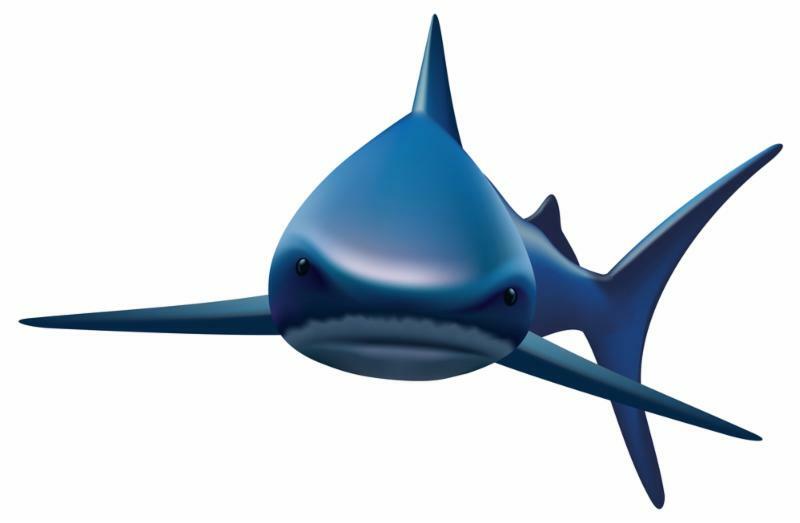 It is like the old Dogs of the Dow theory on steroids. 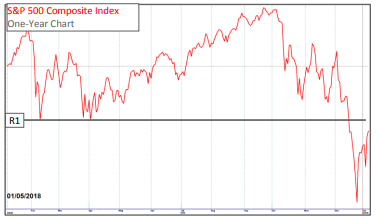 Investors who emphasized what worked last year will miss a nice opportunity. The markets got a double dose of good news this morning. First, the monthly employment report far exceeded consensus estimates and surprised many. The consensus estimate was 180,000 new jobs but the report actually came in showing 312,000. Traders took the number as a sign that weakness in the economy has been overstated and, perhaps, things aren’t as bad as they thought. Second, Fed Chairman Powell indicated in a prepared speech delivered to an economics conference that the Fed would continue to be “patient” in raising rates. The takeaway from many was that the Fed is becoming a little more dovish in its interest rate policy and that future rate hikes, if any, would be measured. The market has exploded to the upside on the double dose of good news (strong economy and an interest rate policy that won’t get in the way). There is no doubt that much of today’s gains are due to short-covering rather than buyers flocking into the market but the result is nonetheless impressive. We’ll see if the gains hold into the final closing hours of the market.